Childhood cancer survival continues to fall slightly beyond five years after diagnosis. 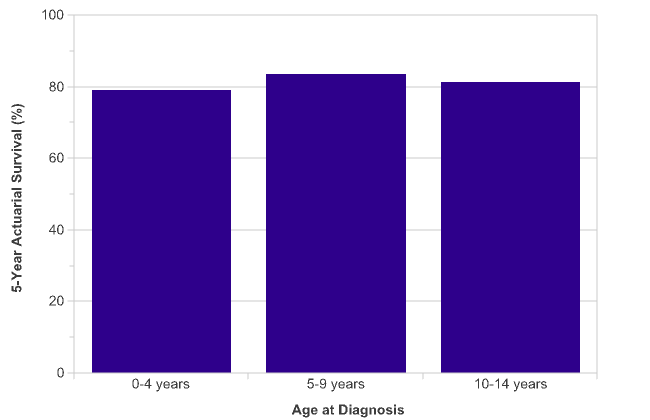 76% of children survive their disease for ten years or more, as shown by actuarial survival for children diagnosed with cancer during 2001-2005 in Great Britain. The vast majority of these long-term survivors will be cured of their cancer, though intensive treatments mean that some groups of survivors experience higher death rates beyond 25 years from diagnosis compared with the general population. Survival for childhood cancer is reported in Scotland and Northern Ireland,[4,5] though it is difficult to make survival comparisons between countries due to different methodologies and criteria for including patients in analyses. National Cancer Intelligence Network. National Registry of Childhood Tumours Progress Report, 2012. Oxford: NRCT; 2013. 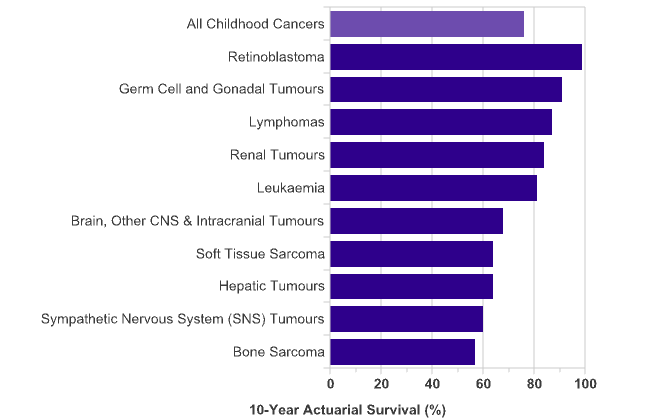 Ten-year actuarial survival, children aged 0-14 years, Great Britain, 1971-2005 data were provided by Charles Stiller at the National Registry of Childhood Tumours on request in 2013. Reulen RC, Winter DL, Frobisher C, et al. 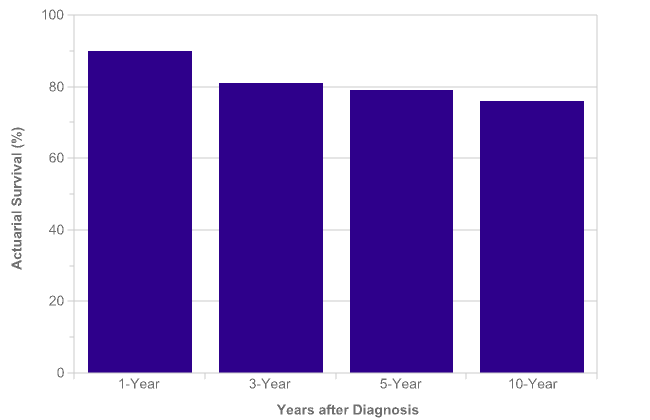 Long-term cause-specific mortality among survivors of childhood cancer. JAMA 2010;304(2):172-9. Information Services Division Scotland. Childhood Cancers in Scotland (1983-2007). Edinburgh: ISD Scotland; 2011. Northern Ireland Cancer Registry. Childhood Cancer: Incidence & Survival 1993-2012. Belfast: NICR. Data is for: Great Britain, 2001-2005 and 2006-2010, ICD-10 C00-C97, D32-D33, D35.2-D35.4, D42-D43, D44.3-D44.5. All children's cancers includes all malignant tumours (ICD-10 codes: C00-C97), and all benign/uncertain or unknown behaviour brain, other central nervous system and intracranial tumours (ICD-10 codes: D32-D33, D35.2-D35.4, D42-D43 and D44.3-D44.5). Five-year survival for all childhood cancers combined does not differ significantly between 0-4, 5-9 and 10-14 year-olds. Office for National Statistics. Statistical Bulletin: Cancer Survival for Children in England: Patients Diagnosed 1990-2006 and Followed up to 2011. Newport: ONS; 2013. Data is for: England, 2006, ICD-10 C00-C97, D32-D33, D35.2-D35.4, D42-D43, D44.3-D44.5. Survival for cancer in children is improving overall. One-year actuarial survival for all childhood cancers combined has increased from 63% during 1971-1975 to 91% during 2006-2010 in Great Britain – an absolute survival difference of 28 percentage points. [1,2] Most of this increase occurred during the 1970s and 1980s. Five- and ten-year survival for all childhood cancers combined has increased by even greater amounts since the early 1970s. [1,2] Five-year survival has increased from 40% during 1971-1975 to 82% during 2006-2010 in Great Britain – an absolute survival difference of 42 percentage points, while ten-year survival has increased from 36% during 1971-1975 to 76% during 2001-2005 – an absolute survival difference of 40 percentage points. 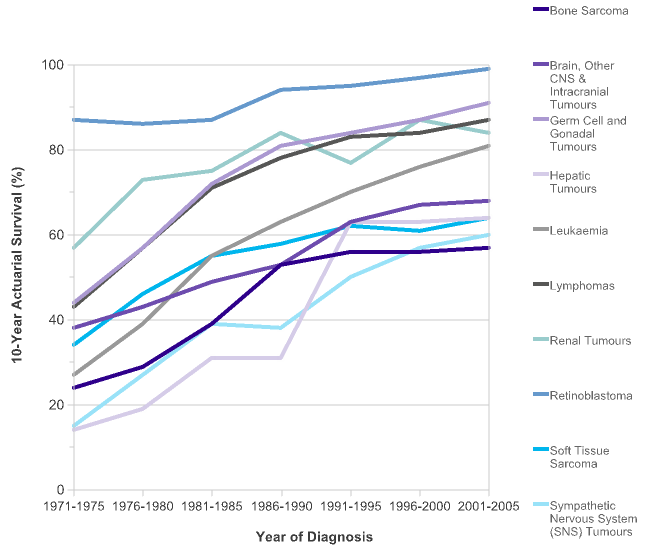 Ten-year survival has increased for all diagnostic groups since the early 1970s, but by varying amounts and at different points in time. A lot of the progress can be attributed to the advent of combination chemotherapy in the late 1960s and 1970s. For many diagnostic groups, improvements in survival coincide with eras of entry into clinical trials. 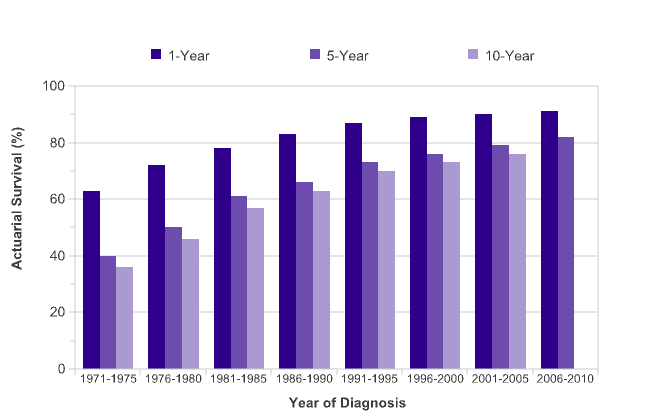 Leukaemia (all subtypes combined) has shown the largest increase in ten-year actuarial survival since the early 1970s, from 27% in 1971-1975 to 81% in 2001-2005 in Great Britain – an absolute survival difference of 54 percentage points. Hepatic tumours have also shown large increases in ten-year survival, from 14% in 1971-1975 to 64% in 2001-2005 (an increase of 50 percentage points). Retinoblastoma has consistently had the highest survival of all the childhood cancers over the last four decades; even so, ten-year survival has still improved from 87% in 1971-1975 to 99% in 2001-2005. Stiller CA, Kroll ME, Pritchard-Jones K. Population survival from childhood cancer in Britain during 1978-2005 by eras of entry to clinical trials. Ann Oncol 2012;23(9):2464-9. Data is for: Great Britain, 1971-2010, ICD-10 C00-C97, D32-D33, D35.2-D35.4, D42-D43, D44.3-D44.5. At least 15,000 more children have survived their cancer for at least ten years than would have done if survival had remained as it was in the early 1970s. The ACCIS project has enabled a detailed analysis of survival from children’s cancers in Europe. For all childhood cancers diagnosed in the period 1988-1997, five-year survival was highest in Northern Europe (77%) and lowest in the Eastern region (62%); survival for the British Isles was roughly in the middle at 71%. Northern Europe has the highest survival for the majority of diagnostic groups; of notable exception are lymphomas and SNS tumours, which are highest in Western Europe. Eastern Europe has the lowest survival for all of the diagnostic groups except carcinomas and melanomas. Sankila R, Martos Jimenez MC, Miljus D, et al. Geographical comparison of cancer survival in European children (1988-1997): report from the Automated Childhood Cancer Information System project. Eur J Cancer 2006;42:1972-80.